"Firing a Salute," Dominic Serres, 1770, Yale Center for British Art. 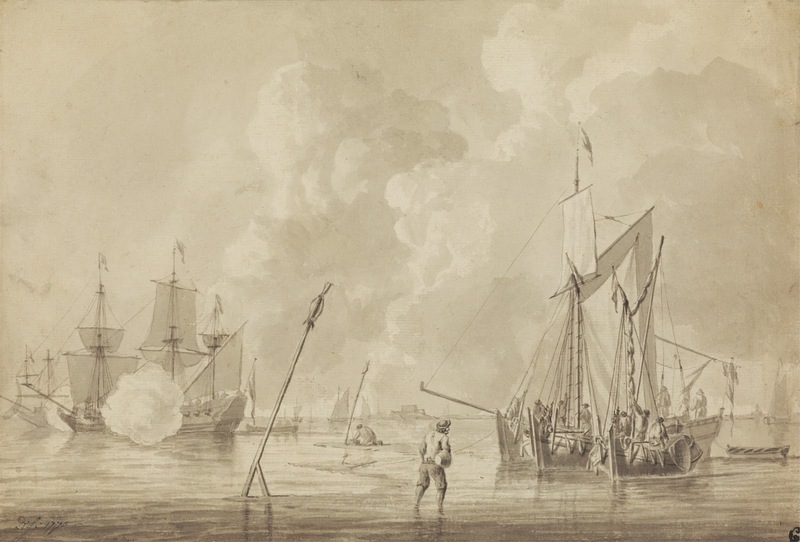 The focus of this piece is the lateen rigged warship in the left of the frame, which fires the titular salute. Our focus is on that of the men gathered around the sloops huddled to the right. If I were to guess, I would wager that the men in the boats are fishermen. They all wear short brimmed round hats or caps, and most are in shirtsleeves. It appears that a few wear jackets or coats, but the only lower garment in view is that worn by the fellow wading in the shallow water. Along with his short brimmed hat and plain shirt, it appears that he wears a waistcoat tucked into his breeches. Either that or Serres has exaggerated the lines of his shirt's armscye. The man does not wears slops nor trousers, but a pair of plain, dark breeches.